We love photos that show motion while still maintaining enough focus on the subject. This is one of Marchet's favorite shots. It was taken indoors in tungsten light with no flash. Aperture was f/3.5 at 1/4 second shutter speed. She was able to keep focus on the toddler's face by panning with the subject as he ran. Photographs make great gifts! A client and also a good friend opened our gift to her and she said she nearly cried. Why? Oh, it may just be these adorable photos of her toddler in a collage frame. She had no idea had done the photo shoot while we were babysitting the little tike; so it was a complete surprise. We did the same kind of gift for my uncle and aunt this Christmas. When we went to visit during Thanksgiving, we set up a simple backdrop in the front room and did some quick headshots while the parents were taking a nap. The 3 boys loved the attention, and since we knew we only wanted headshots, we were done in about 10 minutes. Here's what we learned about doing these kinds of gifts. 1. Get the frame first. The frame and matting will guide you as to the coloring and the style of the shots you will have taken. 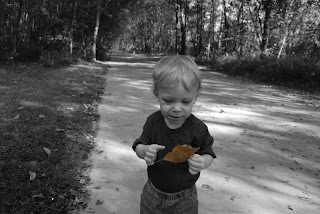 For example, the 3 boys' frame dictated black and white photos for a very modern look. 2. Think about clothing. Our friend's little toddler wasn't wearing an outfit that would have looked right in the picture, so we changed him into the cute striped shirt that you see above. Because we were doing headshots of the 3 boys, the only thing that really mattered is that the top of their shirts look the same. 3. Preplan poses and backgrounds. In each of these photo shoots, we used a simple backdrop cloth to cut out all the "busy-ness" behind the subjects. We often use just a bed sheet or a length of material. It works great for little bodies like these. 4. Make the shoot a playful experience. Kids faces don't lie: if they're having fun, it shows. If they aren't, well that shows too. Since we are parents ourselves, we have experience in the getting a fussy kid to smile realm. We usually have props to coax smiles out of our subjects. 5. After the shoot, try out several arrangements of the photos before ordering the final prints. We cropped and tweaked our favorite photos and then printed them out from our computer to arrange on the frame. It was great to have something tangible to play around with before making any print purchases. It also made it easy to visualize the final product. 8. Assemble with care. Have your photos printed and set them into the frame. Be careful not to smudge the glass on the inside of the frame, and give yourself time to make small adjustments to the photo placement in the mat. There's nothing that catches the energy and emotion of children like candids at the park. These photos were taken for a client who specifically requested black and white shots, but of course, we loved some of the color photos too. One of the advantages of this kind of photo shoot is all the great "architecture" the playground equipment provides. Also, since kids are having fun at the photo shoot, they tend to ignore the camera and show genuine expressions. We did a few head shots for the client too. Although it was challenging to keep the youngest boy focused, we did get a couple gems like the one posted under "Park Photo Shoot Shots." This little tike loves leaves! I took the opportunity to snap a couple candids while he was examining this specimen. Later, I realized this picture would be great as a black and white with spot color. Although it took a little work to get it just right, I think it turned out great. The client had this picture printed up on mugs for the grandparents. Fun idea! If you are interested in a special edit like this one, please let me know before the photo shoot. Special edits take more time to create than a regular black and white image, so there will be an increase of cost of $10 per photo given this treatment. Think about the areas in your home you will be hanging your finished portraits. The family room? Bedrooms? Going up the stairs? Use the décor in that area inspire you as to the style and color of your outfits. Now you are ready to start. You can get a great look by building your clothing around one person's outfit that goes well with your décor style. It's usually best to start with the person in the group who has the least amount of clothes or who is hardest to pick an outfit for. Look through their closet for a great piece you want them to wear for the photos. You might also consider buying an outfit for that person and going from there. In the above example, mom wanted to wear this great patterned top with a jacket and jeans. Now that you've got one person's clothing done, you can build the rest of the group's outfits. 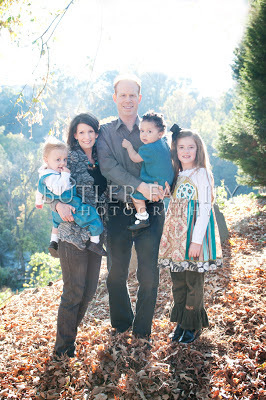 For this family, I helped choose colors for the kids' and the dad's outfit based on the greens, whites, and blues in the mom's shirt. Notice that mixing solids with patterns and prints is okay! Another method is to pick a color scheme for your group clothing. As in method one, keep in mind what rooms you will be displaying your portraits in. If you want to hang your portrait above your mantle in the living room, look at the colors in that room to inspire your outfits. Option 1: Neutrals like jeans, grays, browns, blacks, creams, etc. are always a great way to start building your family photo shoot's outfit. This season, you can easily pair your neutrals with leather, animal prints, metallic accents, and fur. Option 2: A pop of color mixed with neutrals helps your portraits have more personality and flair. This is one of my favorite ways to build on option 1. The pop of color could be a scarf, a pair of shoes, a tie, belt, or necklace -- or all of the above -- on top of neutral colors. Option 3: Deep, rich jewel tones like ruby reds, royal blues & purples, emerald greens, teals, burnt oranges & yellows are great in fall and winter seasons. These may easily be mixed as long as you stick within the same intensity of color. For example, it would be inappropriate to put one person in a light blue shirt when others are wearing deep jewel-toned shirts. That poor guy in the light blue shirt would stick out like a sore thumb! 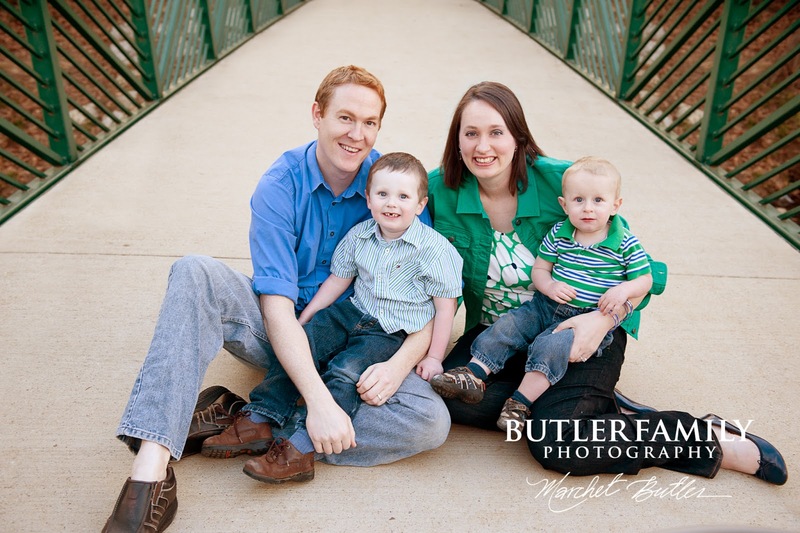 Option 4: Bright, vibrant colors like reds, oranges, greens, and blues are happy and eye-catching in any portrait. You can mix and match colors as long as you stick with the same general color intensity. Option 5: Monochromatic color schemes (shades of the same color) are a classic way to make your group look cohesive. Be aware that the "white shirts and khakis" option is dated, so even if you go with a monochromatic color scheme, you are going to want to mix it up with different pieces so each person looks a little bit different. I'm not suggesting you dress up for your photo shoot like you are going to a costume party, but a well-chosen theme can inspire accessories, hairstyles, props, and the general look of clothing in a shoot. Season-conscious photos like fun chunky sweaters and winter hats with personalities can really set the scene for a shoot, especially if you are planning on mailing holiday cards this winter. Also, remember that you don't always have to get your family photos taken in the fall (or whenever you generally have them taken). I plan on having our family photos taken twice a year -- during the spring and during the fall so we aren't wearing the same type of clothing in every portrait. Your shoot location can inform the type of clothing you wear. If you are shooting at an urban back lot, you may want to go for a contemporary look. Shooting at a historic site with a lot of texture? Consider something less flashy and more neutral or monochromatic. Feel free to ask me about what sort of location and attire would be appropriate for your Alpharetta or Roswell family photography session. Vintage-inspired looks like Victorian, 40s, or 20s are trending now. Do you already have a vintage hat or prop? You'd be surprised how one piece can transform the look of an outfit. 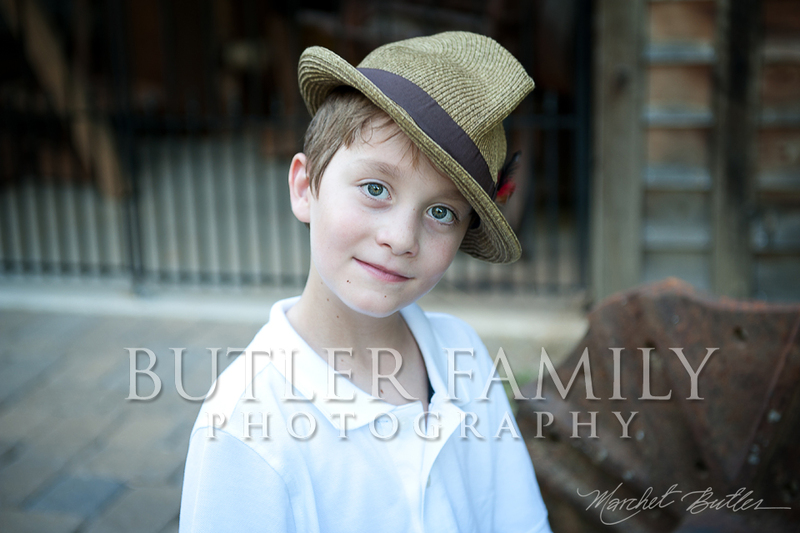 I love how this authentic 40s hat transforms any boy into a little Frank Sinatra. Shirts that are totally white (unless paired with a vest or jacket) tend to get washed out in a photograph, especially when outdoors. Avoiding pastels is just my own preference. I don't think pastels are especially complimentary in my style of photography. Smaller patterns on part of an outfit look fine, but keep it to one or two people in your group. Patterns should compliment each other, not draw attention away from the main subject of the photo, you! Colors don't have to match, but they do need to go together. Clothing from the same color pallette or based on colors in one outfit tend to create a cohesive look without feeling too "matchy." I love fun and vibrant colors; they help the portraits "pop" off the screen or print, but remember, the emphasis of the photos should be on your faces, not your clothing. Since your images will include images in black and white, you will want to think about how your outfits would appear in those shades. This is an especially important rule! Remember to keep intensity of colors similar. Don't let someone wear a light-colored top when everyone else is wearing dark-colored top. Using props and accessories is a good way to get different looks out of a single outfit. Think about things that characterize you and your personality: scarves, shoes, items from your line of work, hobbies, and interests. Watches tend to be distracting in photos, so if you usually wear a watch, leave it in your car. Often, we will take photos of details like hand-holding, rings, and family feet! Remember to clean and trim nails for these shots. For feet, if you have matching shoes or shoes in the same shade, that's a plus. Of course, I love bare feet too if the whether is warm or if we are inside. Take keys, phones, wallets, and change out of pockets. I've made this mistake before and had to Photoshop out the pocket bulges. I hope to never do that again (grin). If you wear glasses, you can choose to wear them or go without them in the photo shoot. I favor going without--and don't worry, I'll edit out any redness around the nose where the glasses usually sit. My least favorite kind of glasses are ones with transition lenses. No matter what the lighting situation, transition lenses do not look good. If you have an alternate pair of glasses, contacts, or can go without, I would suggest doing so for our photo shoot. When you book me as your Alpharetta, Milton, or Roswell family photographer, you are always welcome to an over-the-phone consult about what to wear to the shoot. I've often help finalize outfit choices in person. Looking for more? Another great page about clothing choices is at Koren Reyes Photography with more examples and photos about clothing choices. I'm also a fan of Polyvore's trend list. Please see our current pricing page. a. To copyright the same in the photographer’s name or any other name that he/she may select. b. To use, re-use, publish, and republish the same in whole or in part, separately or in conjunction with other photographs, in any medium now or hereafter known, and for any purpose whatsoever, including (but not be way of limitation) illustration, promotion, advertising, and trade. c. To use my name or my child’s name in connection therewith if the photographer so decides. I hereby release and discharge the photographer for all and any claims and demands ensuing from or in connection with the use of the photographs, including any and all claims for libel and invasion of privacy. A copy of this release shall be as valid as the original. I have read the foregoing and fully understand the contents hereof. I represent that I am the parent/guardian of the below named model(s), and I hereby consent to the foregoing on his/her/their behalf. c. To use my name in connection therewith if the photographer so decides. I have read the foregoing and fully understand the contents hereof. I affirm that I am over the age of majority and have the right to contract in my own name, and I hereby consent to the foregoing.